Have you ever stayed at a fancy and expensive hotel where the room design makes no sense? You might find expensive finishes, high thread count sheets, electronic window shades but somehow there are no towel hooks in the bathroom or anywhere to put your suitcase. Fellow Point Me blogger Shelli covers the frustrations with many of these. It’s like the interior designer never stayed at an actual hotel. However, staying at Homewood Suites by Hilton Needham Boston is a very different experience. Once you come across a reasonably priced hotel that has all the things to make your stay comfortable and convenient, you get what you’ve been missing. Homewood Suites by Hilton Needham Boston is one such hotel. Everything just makes sense and is built around the guest experience. The rooms are big and well designed, the lobby looks modern and fresh and the bathrooms have towel hooks. You’d think that such a simple thing as a towel hook would be ubiquitous, right? For some reason hotels are really stingy with towel hooks. I chose Homewood Suites by Hilton Needham Boston because I was visiting a family member who lives in Newton, MA. The hotel is located near a freeway, so if you have a car, getting on and off the freeway is a breeze. Tripadvisor has its headquarters practically next door and the hotel is surrounded by office blocks. There’s no public transportation nearby and I didn’t seen any eateries within walking distance. The hotel does have a shuttle that can take you anywhere within a three miles radius. I didn’t rent a car and chose to use Uber instead, but if you want to explore the area more, a rental car would definitely be a good idea. Check in was a breeze. I always email the hotel beforehand and ask for a higher floor and a room facing away from any busy streets and that’s exactly what I got. I have Hilton Gold status through my Platinum Card from American Express, though I booked the hotel with Chase Ultimate Rewards points because I didn’t have any Hilton Honors points and I wasn’t expecting to be recognized as Gold member or receive any perks. However, I did mention at check in that I am a Hilton Honors Gold member and I was provided two bottles of water. Pro Tip: hotel stays booked through third parties, such as Chase travel portal, online travel agencies or third-party hotel booking sites aren’t eligible for any elite benefits. You also, most likely, won’t earn elite qualifying stays/nights or hotel points. The hotel is fairly new and the lobby is beautiful and modern. The entire property is decorated in beautiful shades of gray with chrome finishes and beautiful light fixtures throughout. 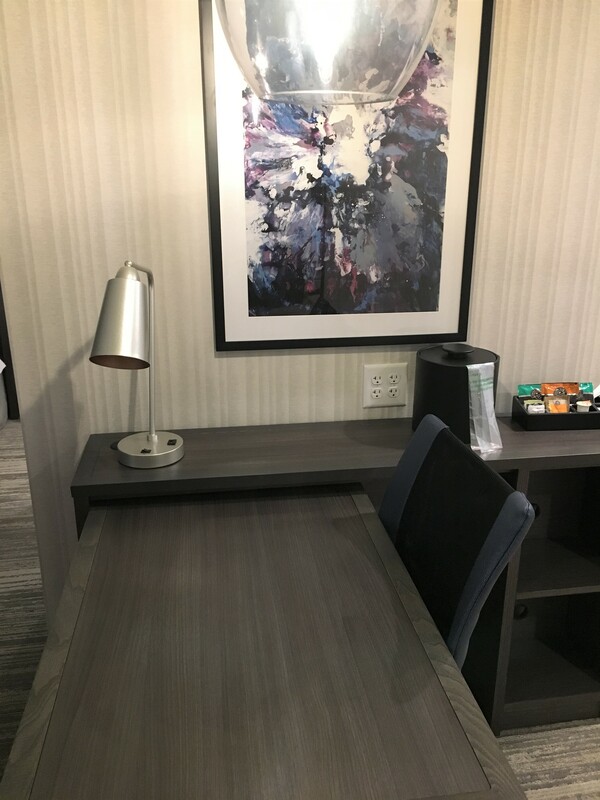 I love contemporary design, and I was pleasantly surprised that a three star hotel looks so sleek, modern and bright and has lots of high-end finishes. I booked a standard studio room with two queen beds, the cheapest room category. The room is very spacious and well designed, everything is thought through and everything makes sense. I love gray interiors, so the room decor really appealed to me. The suite came with a small kitchenette with a full sized fridge, cooktop, microwave, toaster and even a dishwasher. The cupboards are stocked with utensils, silverware, dishes, pots and pants. There’s a sitting area with a pull out couch and a separate work/desk area. The desk is on coasters, so you can easily move it around as needed. Outlets and USB charging ports are everywhere! The charging ports are embedded in every desk lamp, and everywhere you look there’s an outlet. A whole family of five can stay in this room and everyone should be able to charge multiple devices at the same time. The bathroom has a separate sink/vanity area with a large closet and a separate room with toilet and shower. Here again you see high end finishing touches like European brand faucets and expensive quartz surfaces. You also get lots of fluffy white towels. The rooms are quiet and the beds are comfortable. The heating unit is noise free as well, allowing for a good night’s sleep. Breakfast is included with every room. Every day there were a few hot items, such as eggs, hash browns and bacon, as well as make your own waffle and cereal stations. There are lots of other breakfast staples too, like hard boiled eggs, oatmeal, yogurt, fruit and berries. I eat gluten and dairy free, and I definitely didn’t feel deprived, there was always something to eat. I stayed at Homewood Suites Needham Boston between Christmas and New Year’s so the hotel was pretty full. Most other guests were families as expected at that time of year. The breakfast area never felt too crowded and the staff were constantly replenishing food and clearing tables. The hotel also serves hors d’oeuvres every evening during the week, the menu changes daily and you’ll find it on the fridge in the room. We were not around to sample any of these, but judging by the menu on my fridge there was a nice variety of appetizers. The hotel also has a small indoor pool and a decent gym with all the standard equipment. I booked the hotel through Chase travel portal. With my Chase Sapphire Reserve, Ultimate Rewards points are worth 1.5 cents when redeemed directly via the Chase portal, so the total cost was 30,670 points – I saved $460. This is why I love having a good stash of transferable credit card points. Sure, they are great for high value redemptions on international business class tickets and by strategically transferring to airline partners you can sometimes receive as high as 6-10 cents per point, but I happily spent them on a trip over the holidays to see family. That was more valuable to me. 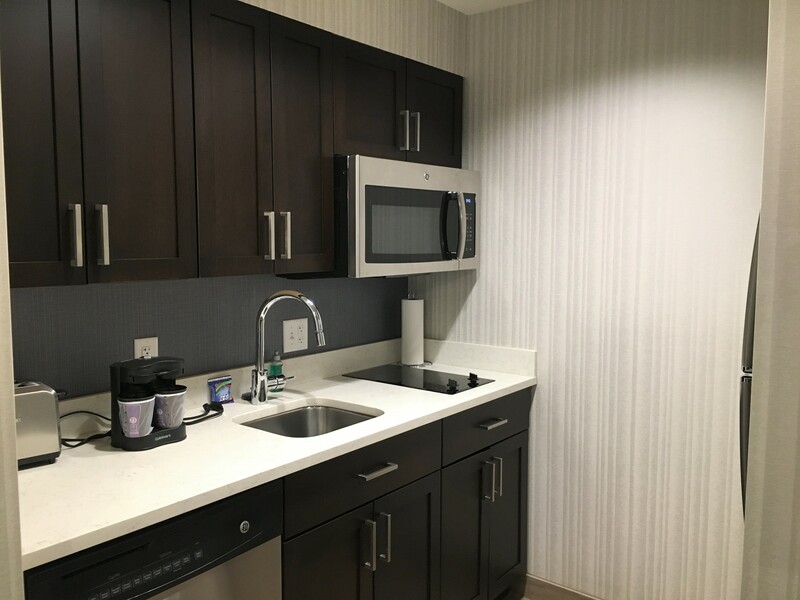 Homewood Suites by Hilton Needham Boston is a great, relatively inexpensive, option for anyone visiting the Boston area, including families and business travelers. The large spacious rooms equipped with kitchenettes and the free breakfast will definitely help to keep the food costs down. A Southwest Plane Just Landed in Hawaii!